We start this round up with image number 22, a 12-second exposure taken with the camera placed on the wet paving of the newly-refurbished Piece Hall in Halifax. I wrote at the time that sat between the night and the morning is a kind of twilight zone that many photographers call The Blue Hour (there’s also one in the evening but it was morning that I was concerned with). I subsequently blogged about the Blue Hour concluding that it was probably nearer 15 minutes! Image 23 is another “Blue Hour” image and it turned out to be a little problematic from my perspective. Old Lane, from which this was taken is quite busy around 7.30am as it is a rat-run for commuters into the town centre. To get the composition I wanted I had to venture onto some private land and had already incurred the wrath of the security man who grudgingly let me have five minutes but hovered a few feet away throughout. This was a 12 second exposure and I was struggling to find a gap in the traffic so in the end I decided to accept the light trail even though I find it a little distracting. Distracting not because of the colour, one fellow 365-er pondered if a red light trail would look better, but because it is so bold. I’m not sure cropping is the answer as you lose the top of the steps and the splashes of light on the cobbles. Had I more time I would have tried to find a gap in the traffic I think but we work with what we have. A return with a slightly wider lens so I don’t need to encroach onto private land is one option as is returning at 7.30am one Sunday morning when I suspect the security guys will be less attentive. Continuing the Blue Hour which seemed to be my theme at least at the start of the week, image 25 was another Blue Hour offering, also taken within the Dean Clough complex in Halifax. I only took two images before the heavens opened and I was left scurrying for the car dragging the tripod behind me. My preferred composition had rain drops on the lens and I deliberated between using the weaker of the two images, attempting to clone out the flares or just using the image as-is, all of which deliberation led to another blog post. The consensus from my fellow 365-ers was that emotion trumps technical perfection however and concurred with my decision to leave the flare alone. That said, I posted all the other configurations to Flickr anyway including a mono for good measure! Last week was quite busy photographically. Not however in shooting lots of new work, I averaged three frames a day, but made progress in terms of processing some of my backlog of RAW files, posting same to Flickr and writing blog posts. I am still unable to spend too long out in the cold hence arriving at a chosen location, always one I know, taking three or four images and getting back into the car. Without a doubt my favourite image off the week was taken on Friday the 26th when I pottered down to the canal for the first time in months, albeit in the car rather than walking. The Blue Hour, all fifteen minutes of it, had passed whilst I was driving back to Elland from Halifax, but I was delighted to find a moody sky and knew exactly where to go to take advantage of it. It’s one of the advantages of knowing your patch. I couldn’t resist another visit to this spot this morning (Sunday 28th) . I had found half a dozen compositions on the Friday morning and took the opportunity to add another to my 365. I love the outline of the tree against the sky – something which marks the image out as a winter shot. I am really enjoying the 365 thus far; the experience is far better than the 28-day challenge I undertook one February some years ago and once again I think that 63-2017 set me up very well. In fact I would recommend that anyone contemplating starting a 365 on the next 1st January should start on the previous 1st October to get a feel for the discipline and not have too much worries about missing a day. True, I wake each morning contemplating the image for the day. Those days when I need to take Amanda to work are easier as I grab a camera and know that Dean Clough will have something to offer regardless of the light. Just shy of a third of the images in my 365 as of today were taken in Halifax close to or within the Dean Clough complex. My knowledge of my local patch has come in handy too, especially the two canal-side images at the end of this week when conditions were poor but I knew where a moody, gritty mono might be found! Most days I have my image of the day captured before mid-morning but I do not worry if this is not the case and even on a day like yesterday when the weather is foul, I found a creative image indoors (below); one that would probably have remained “in my head” had I not been undertaking the 365. That’s it for this round up which covers the period 20th-28th January inclusive. Expect a month one update next week. We are also only nine images from one hundred consecutive daily pictures so expect a further update, incorporating the first six days of February around that time. Down to the canal for the first time in months this morning. The “Blue Hour”, all fifteen minutes of it, passed whilst I was driving back to Elland from Halifax but I was delighted to find a moody sky and knew exactly where to go to take advantage of it. 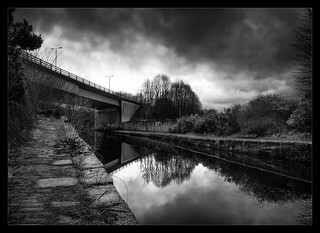 The canal is one of my favourite sources of photographic inspiration and prior to last November I was down there several times a month. This was my first visit in almost three months and whilst I didn’t wander far from the car it was a real joy to be there. The moody mono being the icing on the cake. Continuing the Blue Hour exploration, which seems to be my theme this week, I dropped the wife at work around 7.30am and then set out to capture my 365 image of the day. I knew I wanted a shot from the carpark outside her offices comprising the view looking back towards “that” snicket and this time of the morning was ideal. I only took two images however before the heavens opened and I was left scurrying for the car dragging tripod and camera behind me. It clearly wasn’t going to stop quickly and as I knew from experience that there was only five or ten minutes of the blue “hour” left I decided to go with what I had. Both looked OK on the LCD screen and both should be sharp as they’d been shot on a tripod at f16 – it was worth taking a chance that I had what I wanted and heading for a warm coffee. Back home I quickly realised that my favourite of the two is the second as it has a stronger composition however there is one snag, it has three rain drops on the lens which given the lighting conditions this morning have flared and stand out very strongly. Removing them is not going to be an easy task, although I will have a go of course. However, I’m trying to present my 365 series largely as-seen with only basic adjustments. So, should I go with the stronger composition despite the hard-to-eradicate drops or should I opt for the weaker composition with the technically better presentation? I chose what I felt was the better composition; emotion to my mind is a far more imporatant element in photography than technical perfection and I felt this version (above) better captured the moment. However, accepting that your mileage may vary I have included the “rejected” composition, the mono version of which is shown below. For completeness, here is the cloned version of my chosen image together with the mono conversion.